Sometimes, it takes some time for certain things to sell on eBay. However with a market like guitars, other musical instruments and accessories, there are always people on eBay looking for the items that she is selling. We made over $800 this week alone from flipping items on eBay! 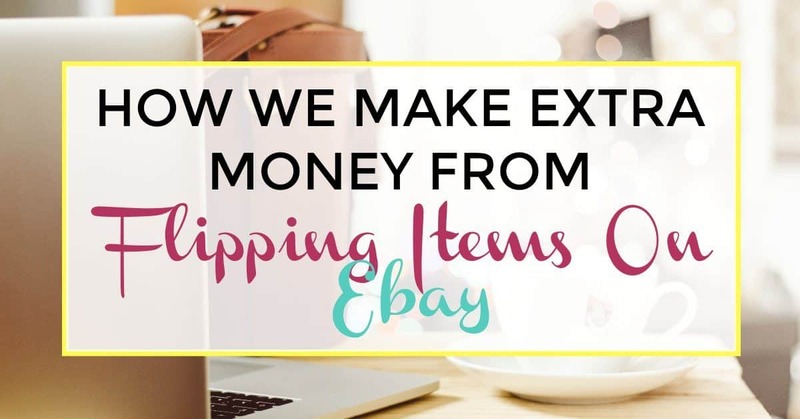 I know my readers are always looking for a new frugal and thrifty way to make and save more money so that is why I wanted to share with you today how we earn money online from flipping items on eBay, so you can maybe sell on eBay one day too! I always was a scrappy and thrifty kind of girl and hated asking anyone for money. Anytime I needed money, I would find some creative or often unusual way to earn it myself. Still being that way and because of my strong passion for frugal and thrifty living, I created this blog! Are you a side hustler too looking for an easier way to make extra money in addition to your day job? Or maybe even looking for an alternative way of earning money and quitting your day job? Check out my step by step, unbelievably easy to follow guide to starting your own self hosted WordPress blog like this one! Hop over to Bluehost with my link to get a free domain, free site builders, free 1-click WordPress install, 24/7 support and all for only $2.95 a month! You really can’t beat that deal. Alright, let’s get to it already. My wife loves and collects guitars. Until this past year, we had so many guitars that there was a room full of them in our house. Then my wife had this amazing idea to start selling some of them on eBay. The first couple of sales went pretty quick and effortless, besides the manual entry for each item description, specs, pictures, etc. All that was left post-purchase was the shipment. Once she sold enough of the guitars she already had, she started buying more for a cheaper price through eBay. She would turn them around and sell them back on eBay. Sometimes that involved making some minor repairs and fixing them up. Now she is starting to build her own guitars to sell on eBay as well. Why guitars you might ask? Guitars have the potential to be heirlooms. Guitars are passed down to children, and other people in your life. The value of a good guitar can increase with time because the demand for a price appreciating possession brings about a profit to a seller. So if you hold on to a guitar for long enough, the value could rise substantially. It is often cheaper to buy guitars on eBay than it is to buy them from a guitar shop. eBay is also normally the chosen shopping portal for guitars when someone is looking for a rare types. Having a high user feedback rating in a promising market for buying and selling guitars, we were able to make that work for us. A high user feedback rating is important in any success as a seller on eBay. Hers is 99.3% positive feedback. This rating is what tells other users if you are trustworthy or not. The higher rating, the more trusted seller. My wife sells about 2 guitars monthly on the side of her day job. We had 3 guitars up for sale last week and sold 2 on the same day. That may not sound like a lot and it’s not but it is only on the side. If she did this full time, I imagine the numbers would be much higher. To sell on eBay, first you need to complete a couple of simple tasks to get started. Create an eBay user profile. Pick what items you want to list for sale. Start listing items for sale. Make sure to take appealing photographs of your items before listing them. When you get started in “flipping” guitars or any instrument for that matter, remember that the higher the seller rating you have the better chances you have at success. This doesn’t mean that you’ll have a flawless record so don’t be discouraged if a buyer gives you negative feedback. This happens from time to time because buyers are spending a lot of money on something that they will keep for a very long time, and any type of imperfections may count against you. As long as you are honest and thorough in your descriptions, you’ll do just fine. Check trending prices on similar items. My wife checks the trending prices for guitars similar to her listings, and often plays with the price to make the sale easier. She currently has a guitar listed at $525.00 (the listing on the bottom in the screen shot, to the left of this text) which is a medium price on a used but new Gibson Firebird. This will give us a $200 profit since the guitar was bought at $316. If you come to a point when your items are not selling quickly, it’s possible that it’s just not the right time. My wife has a higher selling rate around August and November and the beginning of summer. This is most likely because people are looking for Christmas presents in the winter and curing that “something-to-do” for the summer. Your success may depend on different factors, but don’t give up! What are your favorite ways to make extra money? This is such a cool way to make money! I’ve been obsessed with flipping shows ever since I was little. Flipping anything is such a rush, making it a fun way to make money for sure!